Blurb: Robie is an experienced traveler. She’s taken the flight from Honolulu to the Midway Atoll, a group of Pacific islands where her parents live, many times. When she has to get to Midway in a hurry after a visit with her aunt in Hawaii, she gets on the next cargo flight at the last minute. She knows the pilot, but on this flight, there’s a new co-pilot named Max. All systems are go until a storm hits during the flight. The only passenger, Robie doesn’t panic until the engine suddenly cuts out and Max shouts at her to put on a life jacket. They are over miles of Pacific Ocean. She sees Max struggle with a raft. Robie is a girl. With a boys name. Ok this book starts out with a lot of promise. Robie is kind of dumb. Well like maybe a lot dumb. Ok. But she is tolerable. Or maybe that was because I knew she was going to crash and be stranded at sea for a while. (Never claimed to be a nice person/hey, she’s fictional). But the premise of the book was very promising. It just never delivered. Yeah the twist was kind of shocking, but mostly it was huh? Ok. Robie disregards almost all of the life saving info she has been given and kind of just decides to become a vegetarian…but doesn’t seem to search for plant life to eat. I just can’t figure it out. The writing was good. I think that was pretty much the only thing that kept me going. 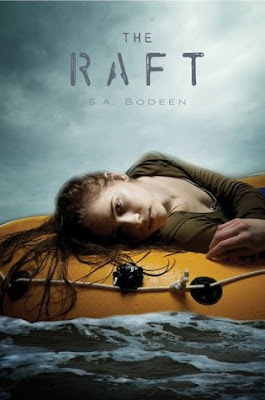 The descriptions of being stranded at sea were awesome, and I love sharks….although thanks to a certain horror author I am a little scared of them. (Yes, Rhiannon, I am talking about you). Max….what the hell was the point of his character? She could have literally…well nevermind that’s a spoiler. Dude if your nose ring hurts take the freakin’ thing out. Come on! hoookkaaay…at this point I am just ranting. Anyway. Worth a read if you have an afternoon to kill, but don’t expect anything epic or awesome from this one. But if he took out the nose ring he wouldn’t look cool anymore. LOL, I liked the honesty in your review. Thanks. 😀 Which reminds me, I should have mentioned Robie is a girl. *eye roll*. What is with authors giving girls boy names?